Be a King with your own Gold Signet Ring! 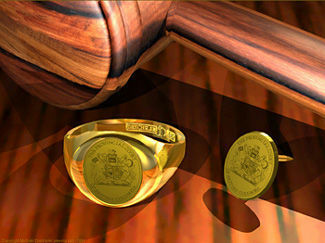 Gold signet rings made by Drechsler Jewelry are individually crafted and engraved by master Canadian hand engravers. Hand engraving is historically important as a method of carving images on gold. Engravers use hardened steel tools to cut the design into the metal. A high level of microscopic detail can be achieved by a master engraver. Give a traditional gift that will become a family heirloom. Easy steps to obtain a quote for your own signet ring. B) TYPE OF RING FAMILY CREST - Email Family Crest as attachment. We need to see the family crest details to quote engraving. INITIALS or MONOGRAM - include the letters to be engraved. CORPORATE LOGO - Email logo as attachment. We need to see the corporate logo to quote engraving. 1) Line engraved style. Reading - image shown as seen. 2) Deep cut engraved style with background removed. Reading - image shown as seen. G) GOLD Gold preference - 14 Karat or 18 Karat, - Yellow gold or White gold. Fill out the Request/Order Form and include the above information. We must have this information to prepare your quote. Call toll free 877-717-7226 or local 604-872-8226 to answer questions.